I received this bottle just after the holidays when my assistant Joe returned home from Northern California (I know, I know) with 3 of his favorite bottles of wine. I appreciated him sharing something like this with me, completely on his own volition. I told him I would make notes about the wines on the blog since he took the time to share the wines with me - this is the first of those posts. Several weeks would pass since receiving the wines from Joe before I even would think of opening any of the bottles. Then came a series of weeks where I would tell him, "I am going to open one of the bottles of wine you brought me," and the next day he would come into my office and ask how I liked it. I would have to hang my head in shame and tell him that unfortunately I had not opened one of his wines. All of that would change one night about 3 weeks ago. It had been a warm day in the valley but not quite unbearable. 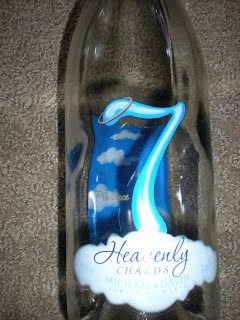 I had one of the bottles Joe brought me, 7 Heavenly Chards, which had been chilling for a while, and decided that would be the night I opened it. I invited one of my colleagues over to partake in the wine with me, and he brought over crackers and Tillamook Pepperjack cheese. I own, as a gift from a colleague, a wine opener that uses compressed air (somehow I have given all of my manual openers to people who didn't have any). I mention this because the opening of the 7 Chards pr oved to be a comedy of errors. 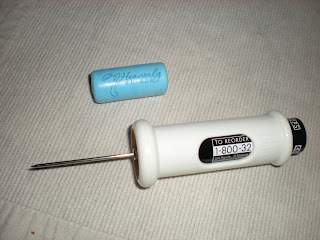 I inserted my opener into the cork (not made of cork, but rather a plastic-type material), and pressed on the can of air. I did not expect that for the first time ever, my compressed air opener wouldn't work, but rather, the apparatus was spit back out to me. I was a little perplexed and thought perhaps I had done something wrong. I re-inserted the metal into the cork (the same hole mind you), and the same result occurred. I had to try a third time, and this time I created a new hole for the tube and hoped it would have a different outcome (what is the definition of insanity again?). After more than 15 minutes and almost having to break into my neighbors apartment (with her permission) to get cork screw I was able to successfully open the bottle of wine - the things we do for wine. While I didn't make formal notes, there are certain things I remember about the nose and color of this Chardonnay. I remember liking the hints of fruit we could smell - the pears and a light citrus aroma wafted out of our glasses. I remember the clearly yellow hue and came out of the bottles and into our glasses. I recall the way our glasses were coated and nice legs showed through. Legs that were evenly spaced at about 1/4 of an inch apart and were present around the entire glass like the poles of a carousel. I remember liking the taste on this wine, that was not too heavy, so much that I think it might be my favorite Chardonnay. I am grateful to have such a thoughtful assistant. I am grateful to have been diligent with opening this wine when I really wanted to just say "forget it." I am grateful that I was able to enjoy it with such good company. The only thing I regret is not having taken notes that would have allowed me to do this wine real justice. Bravo to the winemakers at Lodi Vineyards for this outstanding selection! I have spent more time opening botles of wine that proved challenging. Glad you got it open, sounds like it was worth it. Oh definitely! If you can get a bottle of it, I say do it without any hesitation. Even if you may not be a big fan of Chardonnays, this one deserves a chance. Hot hot hot...like my new wine rack!